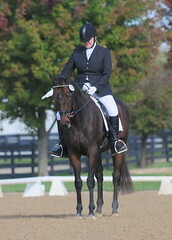 Newly retired racehorses were introduced to their new trainers at the Horse Expo last week. I’ve enjoyed watching Christy bring her young OTTB Remy along over the last year, and I think you’ll agree with me that the results have been dramatic. So I was glad to see OTTBs taking center stage with the Retired Racehorse Training Challeng, which kicked off Friday at the Horse Expo in Timonium MD. Hosted by the Retired Racehorse Training Project, a 501(c)3 that has as its primary mission the promotion of ex-racehorses as pleasure and sport horses, the Challenge will track the progress of three horses and their trainers. For the next five weeks, the horses will undergo retraining with their new trainers. The trainers will show off their charges at the Pennsylvania Horse Expo in February, where a winner will be selected.